This post contains affiliate links. See affiliate disclaimer. Credit to image used in pin goes to DOIOWN, Sagler, Prepac, and IRIS USA, Inc. – Changes were made to the original image. Clothes are spilling out of the drawers, shoes around the corner, blankets, and random items litter your floor and under the bed… well let’s not even go there. Sound familiar? If you’re living in a dorm or a small apartment, your bedroom might not have enough space and feel messy and disorganized. I mean it’s such a small place for sleeping, studying, and living. But it’s also a place for relaxation, right? So it makes sense to put some effort into organizing and beautifying the place. Here are some seriously helpful things that can get for your room. 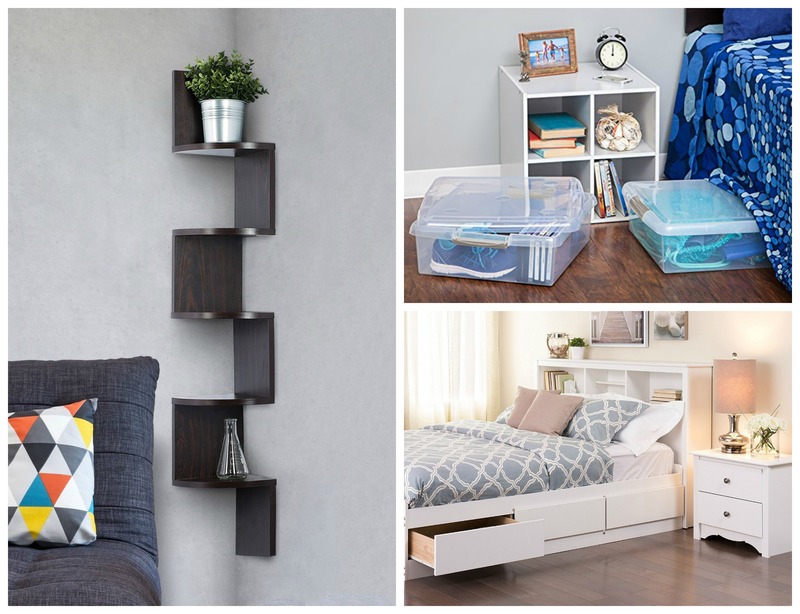 They’re perfect for tiny spaces and the added organization can make your room feel amazing. So check them out and let me know what you think! Double your shoe storage space with this shoe space saver. It keeps your shoes neatly organized and makes it easy for you to grab a pair. All you have to do is slide one shoe into the bottom compartment and place the other on the top. Now you won’t have shoes cluttering your closet! If you really want to maximize your tiny room, the space under your bed is very valuable. Get a couple of these handy bins to put in extra clothes, books or just about anything you want to keep under your bed. It has a lid, so you won’t worry about dust and dirt. You can easily get an under the bed storage here ! Your pants eat a lot of space in your drawers, so try these awesome hangers! They can hold five pants and keep your them wrinkles free. Invest in a sturdy and pretty ottoman that also doubles as storage. Having an ottoman bench is actually a good way to organize your bedroom. It add’s decorative touch to your room and still gives functional storage for your stuff. Basically it’s a win-win. When you live in a small space you need to be clever. Skip the standard headboard and opt to have a storage headboard. This will help your keep books, water, phones, and other bedtime essentials within easy reach. It’s stylish, functional and easy to assemble. You can get a storage headboard here ! If you have a collection of purses and bags, this storage is perfect for you. it has twelve hooks that can handle your purses, backpacks, crossovers, scarves, belts, and other accessories. It’s space-efficient storage and can be hung over a door. You can easily get a purse organizer here ! A boring blank corner could be a decorative piece only if you have this sleek floating corner shelves. It has five shelves that can hold your gear you take with you everyday, a vase or any decorations. Take full advantage of any area available and consider even the corner of your room. It’s the simplest way to maximize space in a tiny bedroom. You’ll love this hanging hamper that’ll keep all your already worn clothes in one place. It hangs from your door or wall saving you much floor space. When its full, you can just carry it by the handles to where you do your laundry. You can easily get a hamper here ! Alright, I hope I was able to help you organize your small bedroom. These hacks are definitely going to make your place bigger and help things stay in order. So give them a try and let me know what you think. Now if you have any questions about these small bedroom organization hacks, let me know in the comments below! I’d love to help you out!